Pregnane is a C21 steroid and, indirectly, a parent of progesterone. It is a parent hydrocarbon for two series of steroids stemming from 5α-pregnane (originally allopregnane) and 5β-pregnane (17β-ethyletiocholane). It has a gonane core. 5β-Pregnane is the parent of the progesterones, pregnane alcohols, ketones, and several adrenocortical hormones and is found largely in urine as a metabolic product of 5β-pregnane compounds. Steroid nomenclature: Pregnanes have carbons 1 through 21. 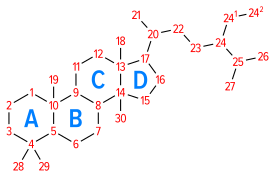 Pregnanes are steroid derivatives with carbons present at positions 1 through 21. Most biologically significant pregnane derivatives fall into one of two groups: pregnenes and pregnadienes. Another class is pregnatrienes.